We remember an America where no one spoke of take-out, dads carved turkeys and moms baked wonderful goodies every week. Daughters spent enough time away from celebrity magazines to share the joy of baking, and you could look forward to the school or church bake sale, knowing there were butter-laden treasures to be found. Mrs. A’s apple pie, Mrs. B’s brownies and banana bread, Miss C’s chocolate chip cookies, and Grandma D’s devil’s food cake were made by women who knew nothing of baking with boxed powders that called for mixed in oil or margarine, or of frosting cakes with a product from a can. Even if you didn’t bake, you would ask them for the recipe. Such a cultural event took place down the block from us recently; but after tasting one bite of everything, we tossed the forgettable rest and focused on the champion imports from Solomon’s Gourmet Cookies in Chicago. Solomon’s offers an extensive line of cookies and bars, made from the finest ingredients, that would make grandmothers throughout heaven nod in approval. The business is the legacy of the owners’ own grandmother, Frieda Middel, who was a beautiful young woman in 1943 when she fell in love with handsome Aaron Solomon. You can follow the story on the company’s website. 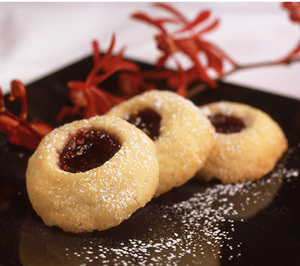 For people who don’t like things sweet, the “Jelly Cookie,” or thumbprint, adds just a little sweetness to the day. 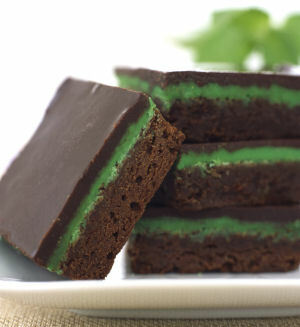 Chocolate Mint Brownies: you can taste the butter, the chocolate, the sugar and the mint. As it should be. Plans to marry were interrupted by World War II. But every few weeks, Frieda would bake cookies from her own recipes to send to Aaron, stationed in Europe. Finally the G.I. returned home, and the couple married and had two daughters. Frieda continued to develop recipes and sent cookies to friends nationwide. By the early 1960s, fifty friends received cookies twice a year. The website shows an old black and white photo of a platter of cookies looking exactly the same as the beautiful colored ones in this article, so Mrs. Solomon clearly excelled at her craft from the beginning. By 1994, 51 years after Frieda first shipped cookies to Aaron overseas, she turned over her recipes to her daughters; ultimately, in honor of Frieda and Aaron, Solomon’s Gourmet Cookies was formed. Solomon’s calls their products “elegant gourmet cookies, brownies and bars.” It’s all semantics, but in the interest of journalism—how “elegant” is a brownie, chocolate chip cookie, or oatmeal bar compared to complex pastries?—we would call them a line of casual standards, elegantly turned out. If you’re a good baker, these are recipes that you would bake as treats for your family—not the fancy wares people expect for desserts. That being said, they are executed as beautifully as any artist could paint them and packaged in a simple but sophisticated presentation that makes the whole indeed more “elegant” and “gourmet” than the sum of the parts. In fact, Solomon’s does not aim to turn heads by being super-rich, over-the-top, complex, sweet or nouvelle. They do what grandmas have always done best: take butter, sugar, chocolate, and other simple, quality ingredients, and mix them into wholesome, familiar, uncloying yummies. They are sweets that are not too sweet. Chocolate chip cookies: white chip, chocolate and peanut butter chip, pecan peanut butter chip, pecan chocolate chip and M&M (no chips). 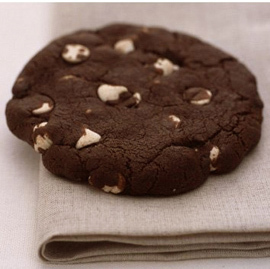 These are not a brown sugar Toll House® style cookie but a lighter, large-format style. 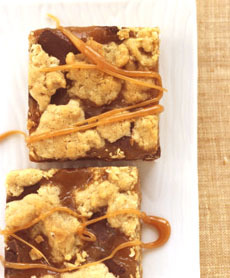 Caramelitas have an oatmeal base with chocolate, caramel, and a streusel topping. Solomon’s makes other items too, but we left them for another day: if anyone reading this wants to send us a gift, we’d like to try the mandel bread and the Muriel Roth bar (a friend of Mrs. Solomon?). 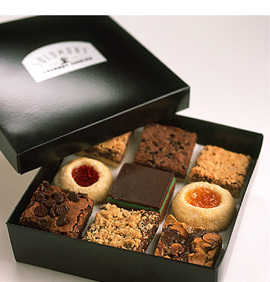 If you live in the Chicago area, there are many other treats you can buy at the bakery that aren’t available online. To see more of our favorite cookies, click here. To see our other kosher cookie reviews, click here. Our favorite white chocolate chip cookie. 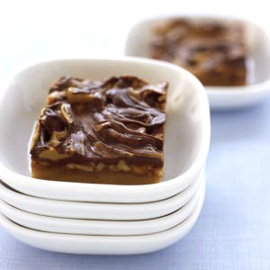 You won’t be slow to eat these Turtle Bars: short- bread with chocolate and butterscotch chips and nuts, drizzled with maple syrup.